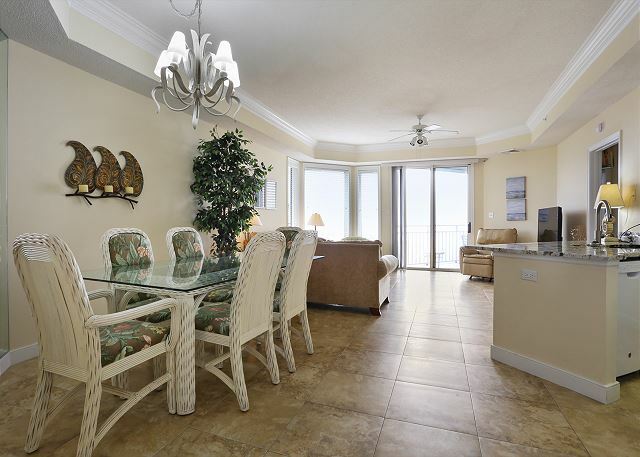 Stay in an exceptional 5th floor oceanside condo centrally located on North Forest Beach. 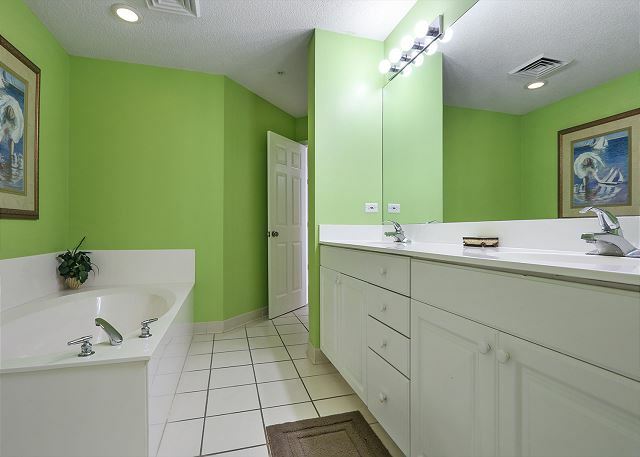 Ideal for a large family. 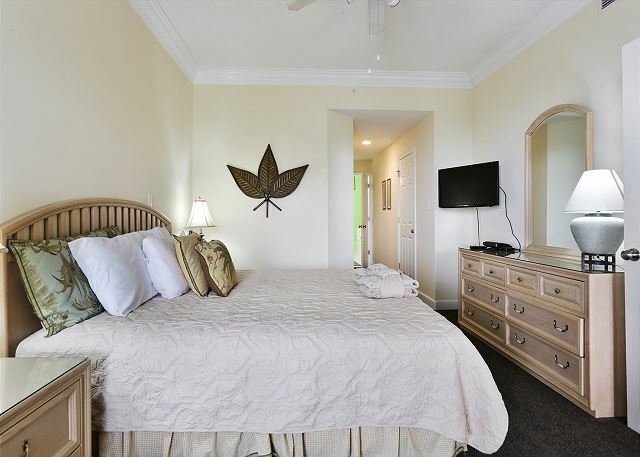 unit 2509 has a king in the master bedroom and bedroom 2, two doubles in bedroom 3, and a living room sleeper sofa. 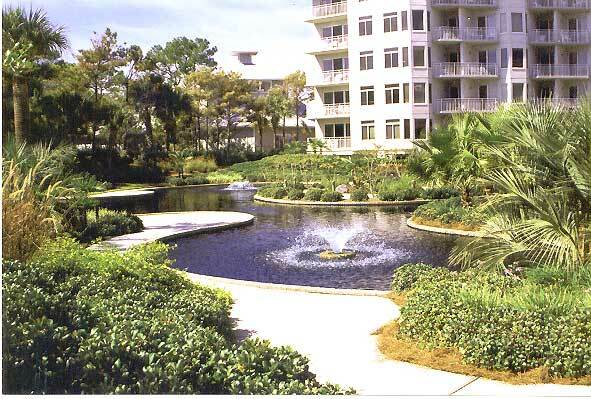 The Sea Crest is a five-story elevator building with covered parking on the ground level. 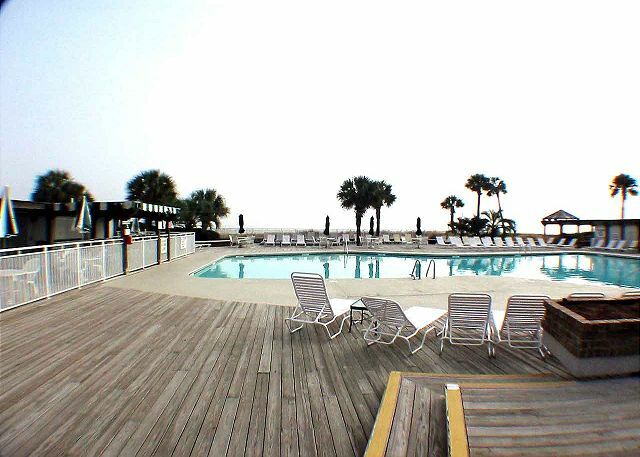 It has two oceanfront swimming pools (one heated in March and April), toddler pool, and seasonal poolside bar. 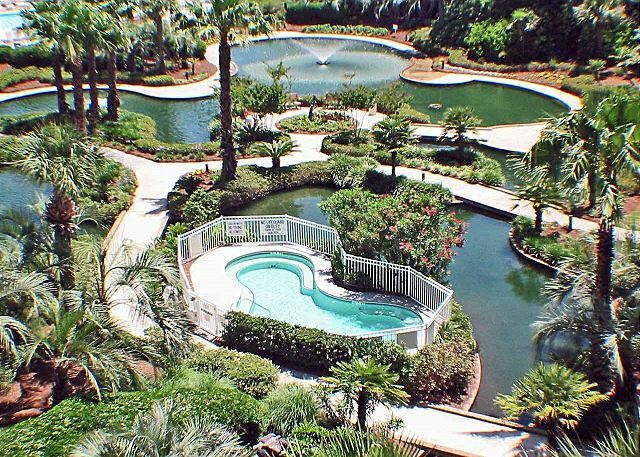 Wander through an incredibly landscaped courtyard with fountains and flora or soak in the hot tubs after exercising at the on-site fitness center. 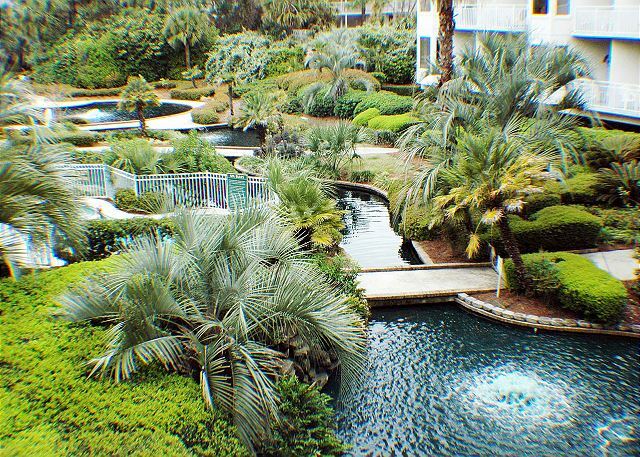 Within a few steps of the Sea Crest, guests find many dining options at Coligny Plaza and Beach Market. This quaint downtown area has a wide selection of shops and entertainment for all ages. Sea Crest 2509 has performed renovations in the condo again in 2019. 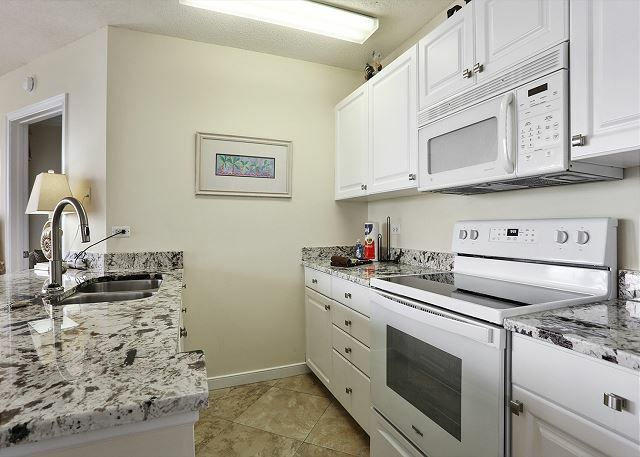 They have painted the entire condo, all new carpet, some new furniture, new bedding, and new granite counters in the kitchen. 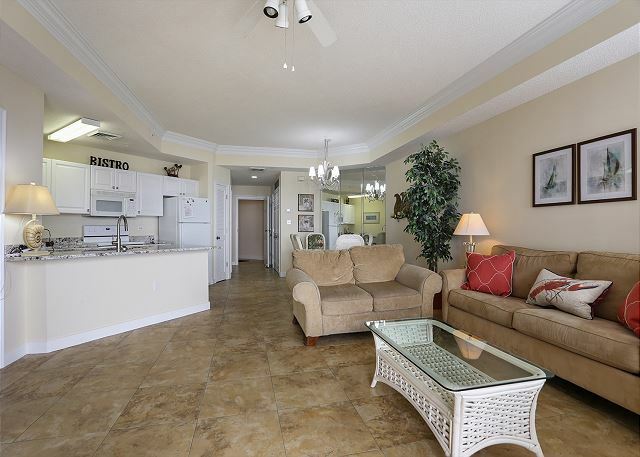 This spacious 3 bedroom - 3 bath condo is the perfect beach retreat! 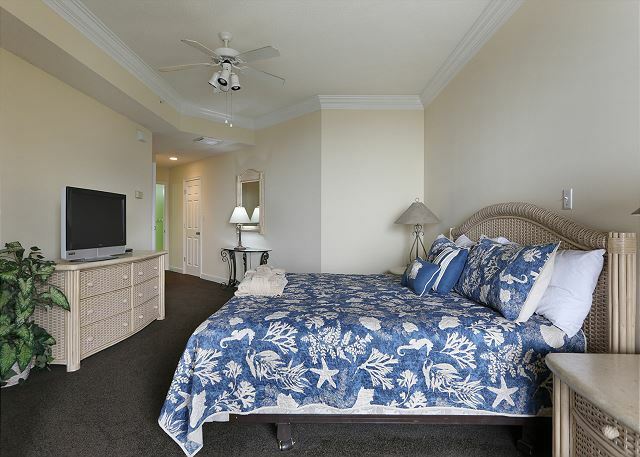 The 5th-floor vantage point and lovely furnishings inside make Sea Crest 2509 a VIP property. Our family of six stayed in this unit for 3 nights over the Thanksgiving holiday and we enjoyed our stay very much. 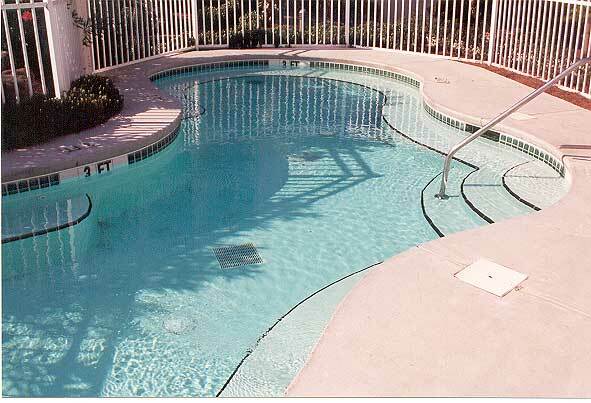 The condo had a great view and we really enjoyed the hot tube and the condo was in a great location. Also Seashore Vacations was great to work with, Lynn was great! We had a great time at our condo. I could use a couple more meals at Sea Shack right now. The condo was more than adequateto fit our needs. The weather was great. We also enjoyed Pool Bar Jims. Cant wait til next time. 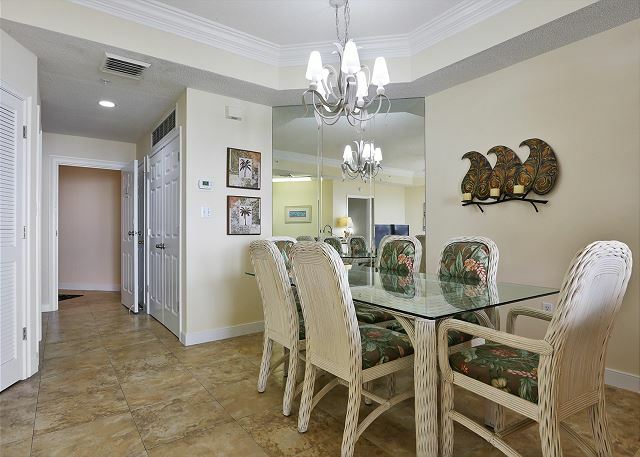 Very nice, spacious, three bedroom, three bath condo overlooking the ocean. Sea rest is very convenient to shopping and many restaurants. Enjoyed our trip very much. Directions for Service & our check in was wonderful. Very hospitable. We have stayed at SeaCrest for 20 summers in various condos. Always perfect! This was one of the best rental we have every stayed in. We each had our own private space due to the design of the Condo. A little high on price, could of had a better selection of dishes and pots and pans. 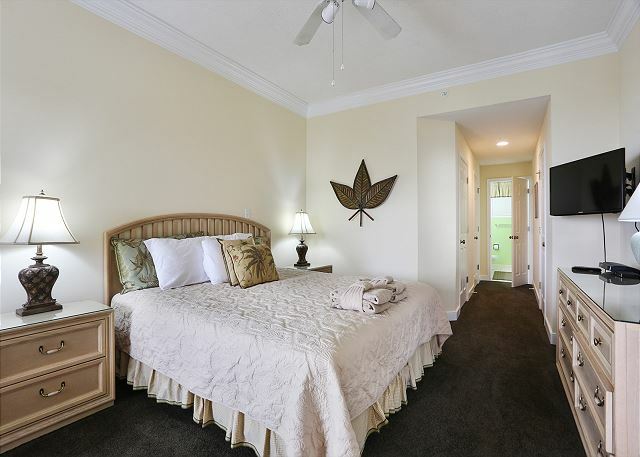 We thoroughly enjoyed this apartment; which was located in the heart of Hilton Head Island; and right on the beach at Forest Beach Area. 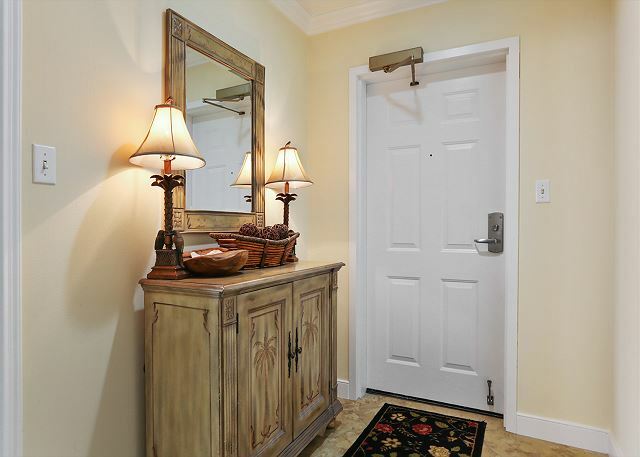 Liens, towels and basic necessities were provided by the Property Management Company. We had a great view (2 balconies) of the ocean (apartment faced east for a great sunrise). We had a minor problem with the cable tv, but the mgmt. company followed up quickly and resolved the issue. Two minor complaints....the ac filter by the kitchen was in need of changing....and there could have been more/better cookware provided. Otherwise No complaints and the price was very good. 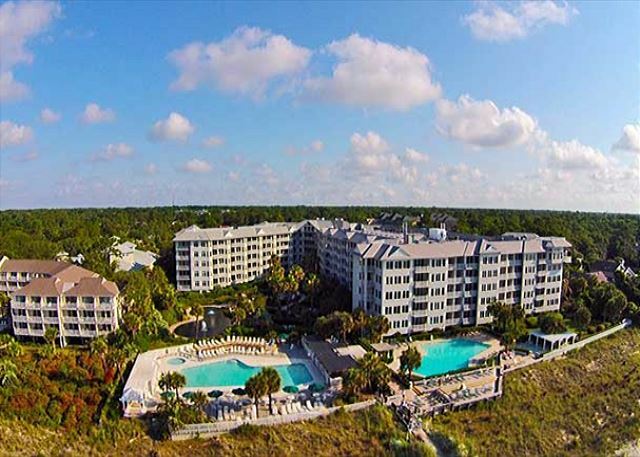 Sea Crest is the most convenient place to stay on the island with its ocean front property, two nice pools, a restaurant/bar on site, and proximity to Coligny Center. Entry lock was a problem initially but prompt attention from management resolved issue. By end of stay, keys were again difficult to use. Some housekeeping issues: Coffee pot was found in pantry still containing moldy coffee and grounds. One patio table was dirty. The other had a cigarette but on it. Rugs at entry door and patio door needed a vacuum. Hair dryer on bathroom wall did not work. 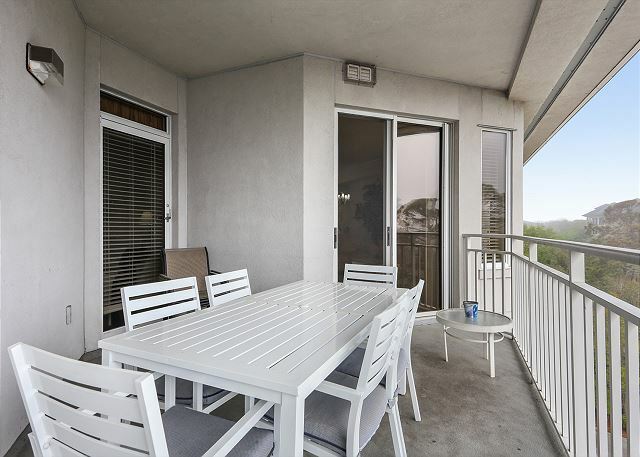 great views, large spacious, terrible mattresses, unit needs some updating, balconies need cleaning very dirty. We enjoyed our stay very much. The weather was perfect and the unit was located in a good spot. Everything was clean and just what we needed. The only exception was we could have used more washcloths. 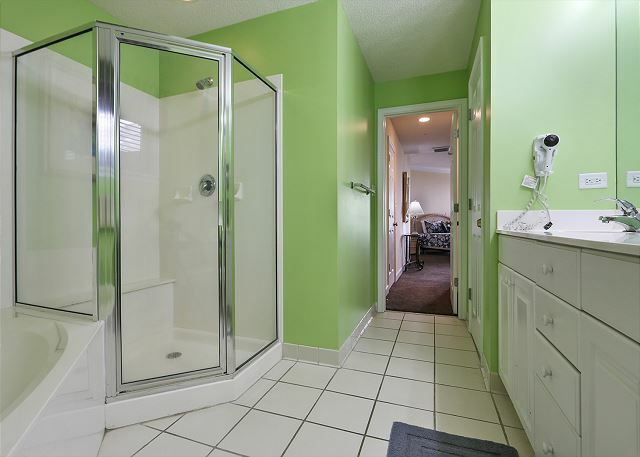 Unit was 2509 nice unit for 3 bed rooms. Unit was nicely maintained, It was ready on time. Working with staff at rental office was very efficient. 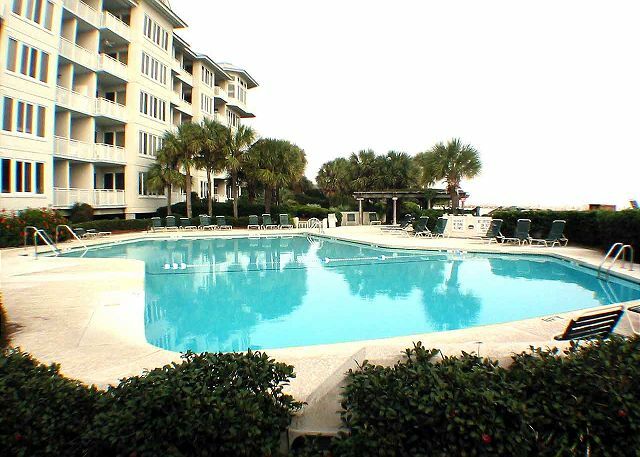 4th trip to Hilton Head- Sea Crest great location,easy access to beach and pools. Had a great time as always at HHI. Our first time to Sea Crest unit 2509. 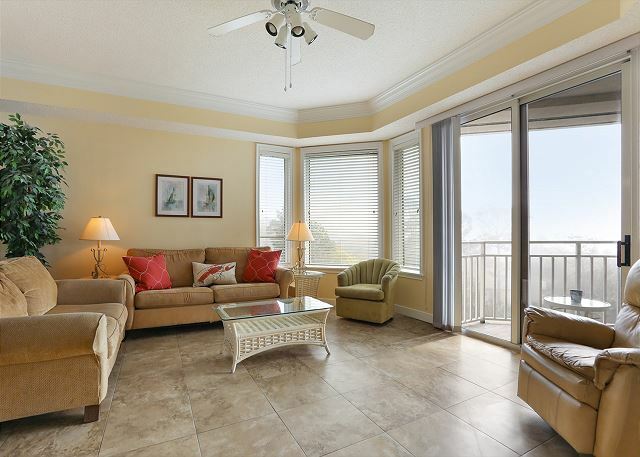 Great condo go view of the ocean. Carpet was a stained, dishwasher leaked, garbage disposal stuck, screen door tore and cabinet door hinge broke. Other than that everything was great. Two great pools and right on the beach. 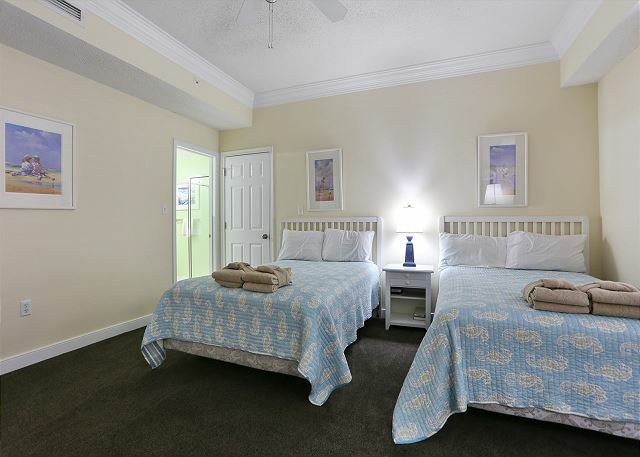 Better location to Coligny than Ocean One that we normally stay at. Reported all that was wrong and they will take care of it right away. 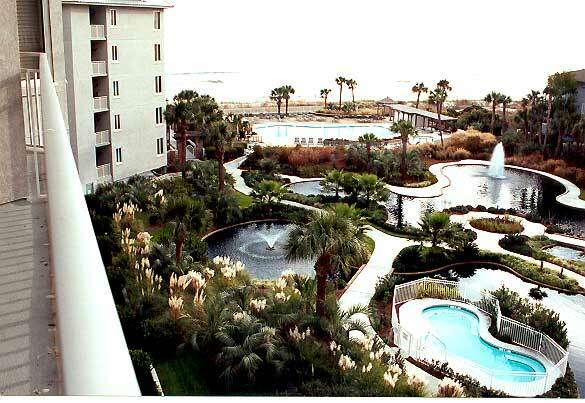 I would stay here again or in another unit at Sea Crest. We have stayed in this very unit for three years running. The rental company was very easy to work with and the location is just lovely and, except for the very small kitchen, the size of the rooms is very nice. We were less satisfied this year in general, though. There was one stopped up drain, another drippy faucet, it wasn't very clean (hair and sand on the floor). The dishwasher is gross, old and not very effective. Only one set of elevators worked up until the last day we were there. No one seems to be paying much attention to upkeep of the facility. Vacation was terrific! Love HHI! 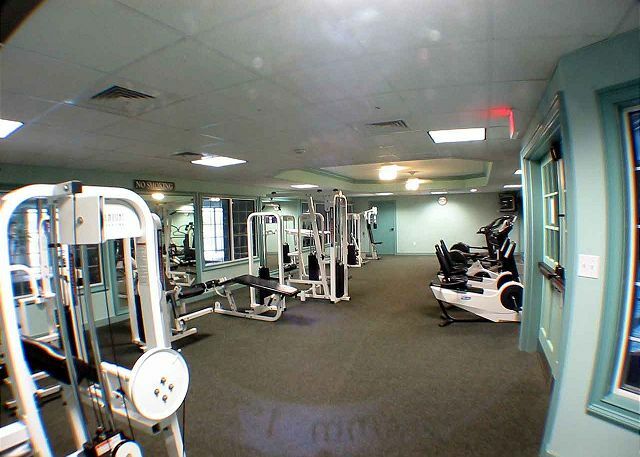 Overall unit is nice and great location, stayed 2 yrs ago in this unit didn't notice any updates, bathroom had sand on floors upon entering,otherwise good unit had a great time would recommend to others. 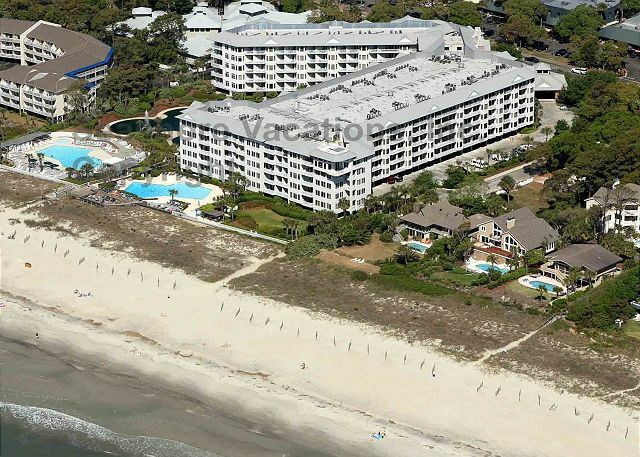 My girls wanted to stay near Coligny, so we decided on a Seacrest villa again this year. The villa was very roomy, with the exception of the kitchen, which we struggled to put two adults in at the same time. That would have been OK, but the kitchen could use some updating. The dishwasher didn't work well and it was poorly stocked with dishes and pots and pans. We never did find a cookie sheet. But the location was very nice and the view was wonderful. We were very pleased with this rental. 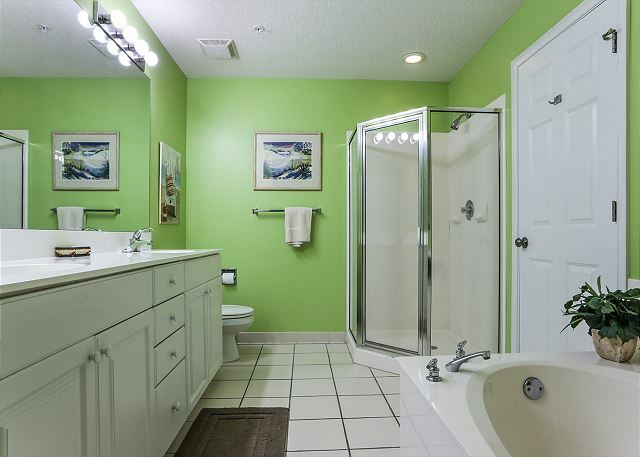 It's in a great location, very quiet, and included everything we needed. We had a great stay. This was our first trip to Hilton Head, but we had a great time and are certain to return. 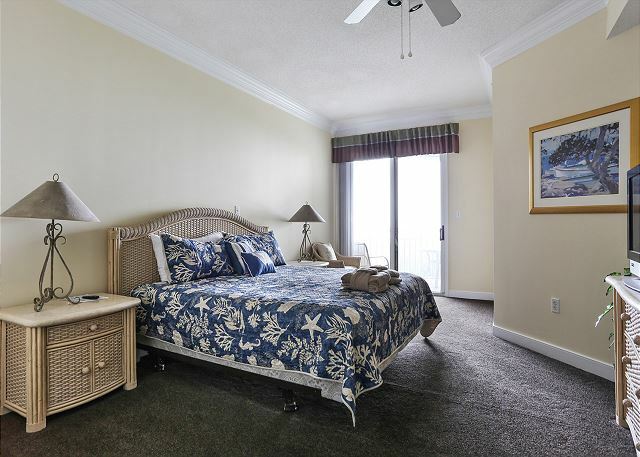 With that said, I will be certain to use Seashore Vacations again and ideally stay in this same condo! 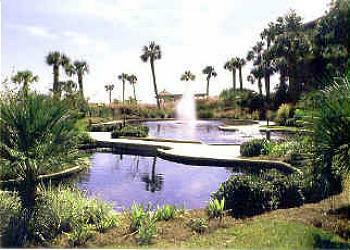 Hilton Head is a great place to do just that,,,RELAX. Seacrest is a great location. Good times with family. Great vacation. I am an annual guest. We Love the condo. And the location. Had trouble with the TVs this year. After two visits from cable man, didn't want to call again. Important when you have children. My family and I look forward to this trip every year! Buddy is great to work with. I would recommend Seashore to friends. The condo is spotless. The balcony could use a little work. 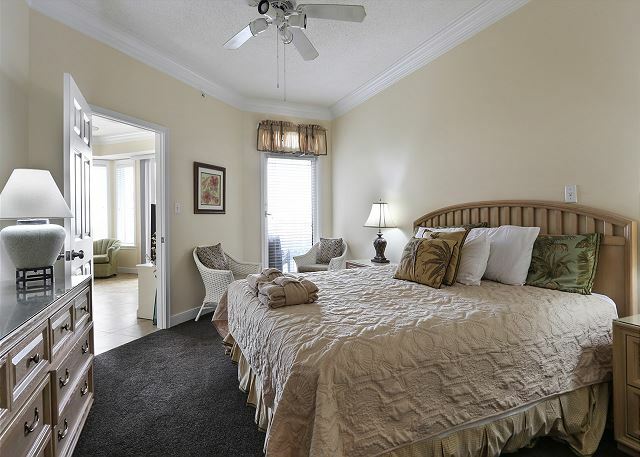 We loved the spacious condo - 3 huge bedrooms and 3 extra large bathrooms more than enough room for everyone! 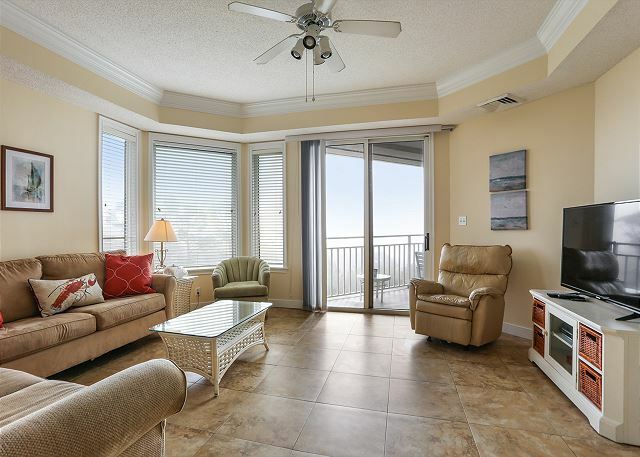 Gorgeous ocean views from private balconies. 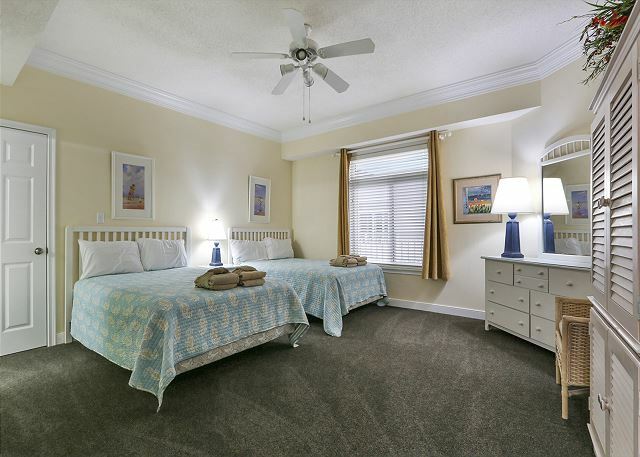 Location was ideal - walking distance right across the street from shops and restaurants of Coligny Plaza. Would definitely recommend to others! Thanks! Loved Hilton Head and condo. I would like to go back next year. Seashore was great to work with. Our whole family had a wonderful stay in this condo! The view was much better than expected! Lots of room-rooms were big and large bathrooms too. Kitchen was a little small, but not a big deal. Does need some new cooking utensils and pots and pans, and a new toaster! What's with the old, yucky toaster-toasters are cheap! But, nothing that was a big deal! Would stay here again! Good condo. Great location. Great view of ocean. Would recommend rental unit. 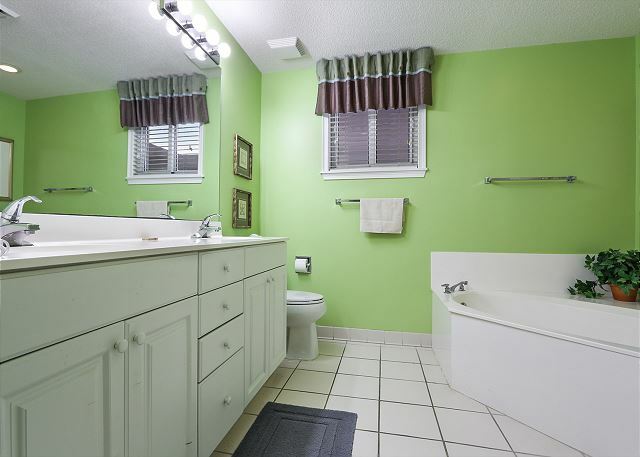 The location was great and the property was in good condition. Overall, we enjoyed the trip immensely. The beds were too firm for our comfort. The pillows and dressers need attention. However,we tend to overlook these little things and we always enjoy Hilton Head Island. The condo was even better than I expected. The view was spectacular from all the main rooms, which helped with those who were not as mobile to see and enjoy the beach even inside. The one weak area was lack of good cooking equipment. It was hard to cook for 7 or 8 people. Need more larger skillets and pots. Also there were no hot pads. Therefore we ate out more than we had planned. But we did have an awesome week and would stay there again. Love the property. Have stayed there for years. Seashore always takes good care of me! Rented this unit for girls weekend and it was perfect for us. 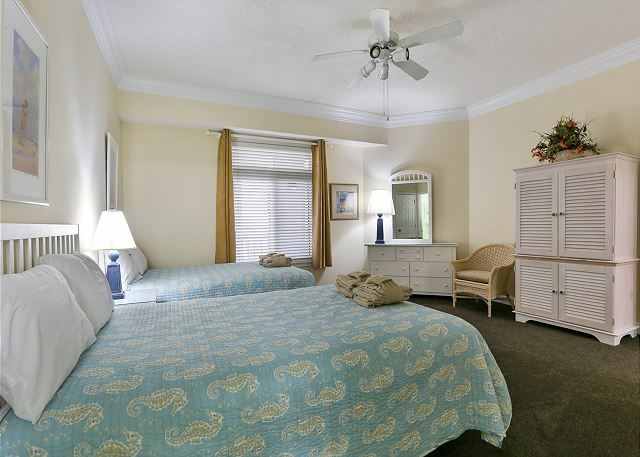 Big bedrooms, 2 with king beds and 1 with double, walk-in closets, walk in showers and garden tubs in the bathrooms. Balconies off 2 of the bedrooms was nice, furnishings were fine. The kitchen area very small but we didn't oook, just made coffee so it was more than adequate. The deck furniture is showing some age and the table should be refinished but we had plenty of room and some privacy too. 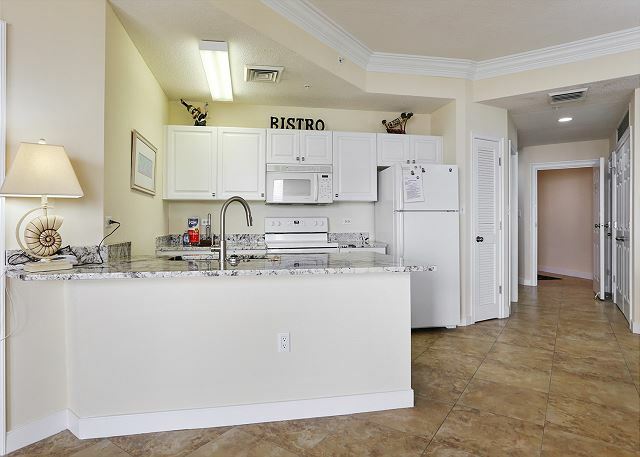 The unit is not the newest, no granite countertops and the bathroom counters and toilets were your basic white but it was great, we enjoyed it and would not hesitate to recommend or stay again. 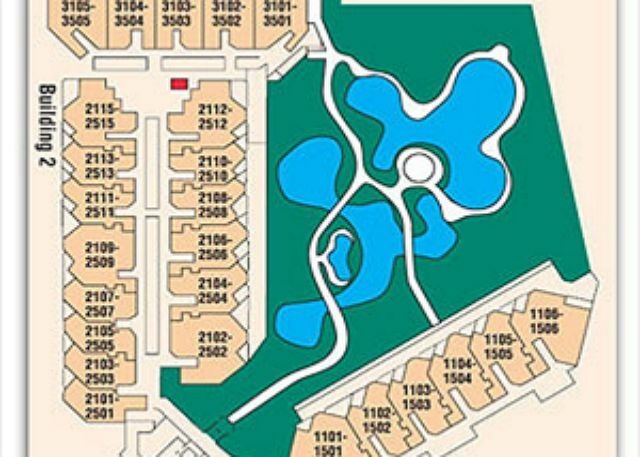 The pools and landscaping around the Seacrest were lovely, even a little pool bar and the beach, well it's the beach nothing can be wrong with that! furnishings were fine, just needed a little more oversight. Love the location! Only suggestion for improvement would be to have more luggage carts available at check in; had to wait awhile before we could unload our car. This is the second time we have stayed at Sea Crest and will definitely stay here again. We had 9 in our party, and the condo was so nice-we had plenty of room for our family! The property was beautiful and you can't beat the location! Would highly recommend. The view from this unit was amazing! 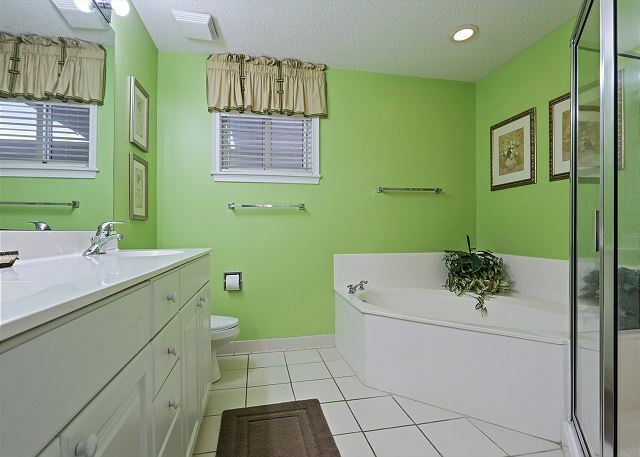 It was very clean and well maintained and there was plenty of space for all of us. The kitchen had a great assortment of essentials as well. The pool was great and you can't beat how close it is to the beach. Beautiful property. Would stay again. 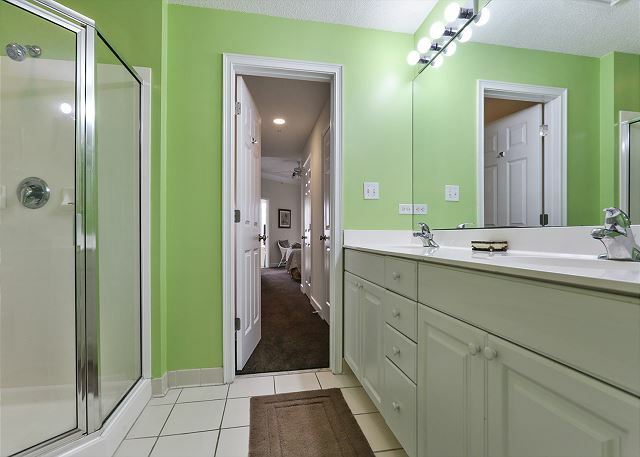 Very clean and beautifully decorated. 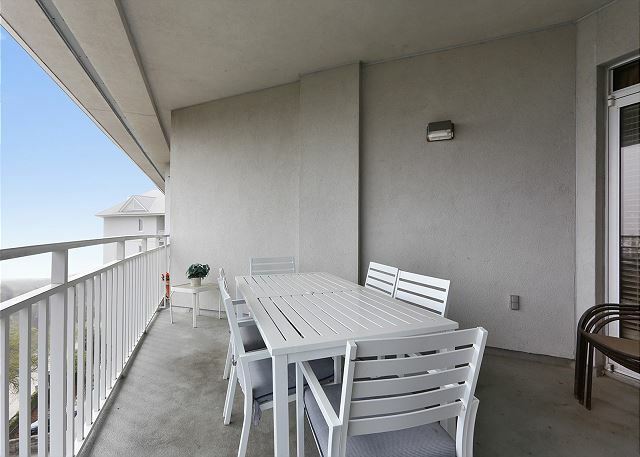 THE UNIT WAS CLEAN EXCEPT FOR THE DECK FURNITURE..
Condo has a nice view, is spacious and the lay out affords significant privacy for each of the bedrooms. We will definately stay here again.